Rural Revolution: A New Contest! A new (and easy) contest to enter! - 6,000 open-pollinated seeds from fifteen heirloom varieties donated by Seed For Security! - And a $10 dollar gift certificate from Home Depot. What do you have to do to win these prizes? Do you have to write an essay or create a video? 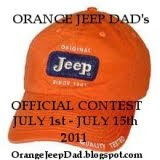 Just head on over to The Orange Jeep Dad blog page and follow the simple directions to get your chance to win.